NORTHFIELD, Minn. -- Sophomore Jesse Faller (Burlington, MA) finished 18th at the 2007 NCAA Division III Men's Cross Country Championship Race on Saturday afternoon. His time of 25 minutes, 3 seconds for eight kilometers led the Jumbo team to a 26th place finish out of 32 teams at the meet hosted by St. Olaf College. The performance came in the first race at Nationals for Faller, whose finish scored 14 points for the Jumbos. The 18th place at Nationals is the best by a Tufts runner since Nate Brigham was 11th on the same course at the 2002 NCAA Championships. On Saturday, Tufts senior tri-captain Dave Sorensen (Dover, MA) placed 79th overall and scored 58th for the Jumbos with a 25:43 time. Senior tri-captain Chris Kantos (Apple Valley, MN) and sophomore Nick Welch (Seattle, WA) were close together with 26:13 and 26:15 times, respectively. Kantos crossed the finish line 175th (scoring 131) and Welch was 179th (scoring 134). 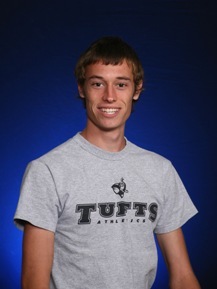 In fifth place for Tufts, 254th overall, and scoring 201 was freshman Greg Pallotta (Syracuse, NY) at 27:08. Also competing for Coach Ethan Barron's Jumbo team at Nationals was junior Dave Tilton (Newmarket, NH), who finished in 27:25, and freshman Jerzy Eisenberg-Guyot (Brookline, MA), who crossed the finish line with a 27:50 time. With a score of 538, Tufts was five points out of 24th place. NYU won the team national title with 128 points. Tyler Sigl from the University of Wisconsin-Platteville won the individual championship with a 24:24 time that was 13 seconds faster than Peter Kosgei from Hamilton College. The race featured 280 runners total. This was the ninth team appearance for Tufts at the NCAA Championship Race.